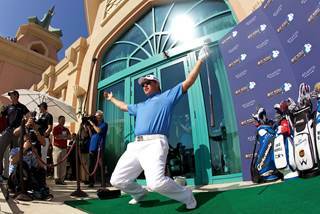 Atlantis, The Palm, the official hotel of the $8 million DP World Tour Championship, was the location for a spectacular golf stunt off the balcony if its luxurious Royal Bridge Suite yesterday, just days before the start of the Dubai based event. The current Race to Dubai leader Henrik Stenson was joined by reigning U.S. Open winner Justin Rose along with Martin Kaymer, David Howell and Lee Westwood, who each hit 10 shots from the balcony of Atlantis, The Palm’s luxurious 924 square metre Royal Bridge Suite, to a floating green pontoon, anchored off shore in the Arabian Gulf. With a 210 metre distance and a 9m x 5m green, it was a particularly challenging hole for the top players. Lee Westwood hit the target and claimed the first prize of the week in the special ‘nearest the pin’ competition, and by finishing just four feet away from the flag on the specially constructed floating green, was declared the winner of the Atlantis Golf Challenge. 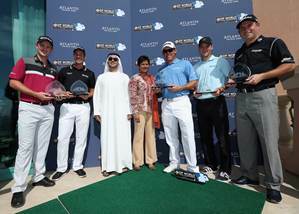 Trophies were presented to all players, as well as a fantastic Atlantis luxury package for the winner Lee Westwood, which included a five night stay in one of the mesmerizing ocean themed Atlantis Underwater Suites, a unique setting with floor to ceiling views, looking out on to the Ambassador Lagoon, the largest open air marine exhibit in the Middle East. As part of the unique prize, Lee Westwood also won a lavish dinner at the newly launched Chinese restaurant YUAN and the opportunity to savour the taste of modern Chinese cuisine with a traditional twist, as well as a sumptuous meal at the world-renowned Nobu. Also included was the chance to experience The Ultimate Dive, a once in a lifetime opportunity to get up close and personal with the 65,000 marine inhabitants of the amazing 11 million litre Ambassador Lagoon. Henrik Stenson acted as ‘mine host’ for the ‘Made for TV’ event, with hotel guests at Atlantis, The Palm invited to view the spectacular stunt from far below the balcony on the Atlantis Royal Beach. 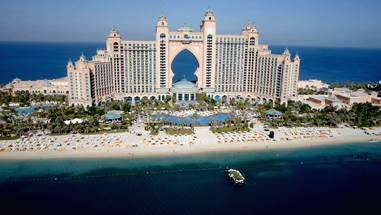 Now in its fifth consecutive year of partnership with Atlantis, The Palm, the $8 million DP World Tour Championship will take place 14 – 17 November 2013. What do you think of the stunt? Let us know in the comments section below or on our Twitter and Facebook pages. Christmas comes early for Sport-locker.net!